Android 8.0 Oreo is one of the most refined operating systems in terms of the user interface. The vanilla Android experience is the best thing for an Android smartphone, it looks gorgeous and provides consistent and smooth performance even on less powerful hardware. But then, how about adding a new element to the user interface to make it look even better? In this segment, we are talking about live wallpapers, but there are lots of live wallpapers on the Google Play Store to pick from. So, how to choose the one which will look better on your smartphone? Here is a list of all the beautiful live wallpapers to download on your smartphone running Android 8.0 Oreo. Pixelscapes wallpaper comes with a collection of three animated pixel art wallpapers which are out of this world. This live wallpaper is a scrolling landscape of a pixelated landscape. It scrolls on its own and if you are running stock Android 8.0 Oreo then it looks gorgeous on the lock screen too. Pixelation live wallpaper displays an animated grid of multicolored pixels. There are tons of settings to choose from like choosing a lot of preset themes, you can build your own too and save them as a default theme. There are a bunch of features like themes, color options, advanced settings, animated, interactive and 3D parallax. Pixel Art City Wallpaper is another gorgeous wallpaper app coming from pixel artists from all around the world. There are thousands of pixelated wallpapers which can be about anything related to cities, landscapes and sometimes the top-down view of a city. 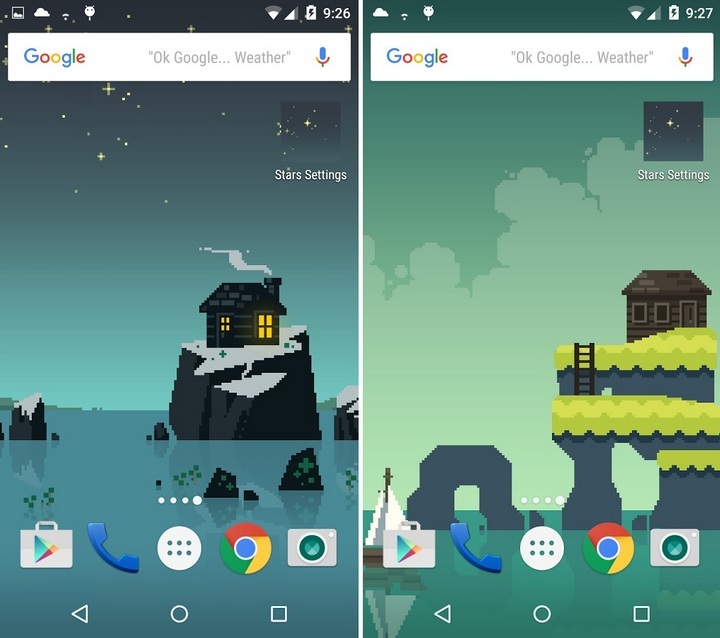 Pixel Road wallpaper is the coolest one on this list. It is a scrolling pixelated road where a car (or any other selected creature) is running. This wallpaper changes the time and weather according to your real-time time and weather. You can choose from 15 pre-built characters and there is one more character which is only available in the donated version of the app. Ditalix is similar to the Pixelon Live wallpaper but with unique and different new combination of shapes. The wallpaper is interactable and animate when you scroll or touch the screen. You can choose your own background wallpaper which will get pixelated and animates. These were the best pixelated live wallpapers which you can install on your smartphone running on Android 8.0 Oreo. You should know that using live wallpapers can drain your battery faster than a still wallpaper.